you know what i find irresistible? food that looks like something different than what it really is. it all started when i made these hot dog sugar cookies, + ever since then, when i see cupcakes that look like hamburgers, or macarons that look like piggies, i swoon with happiness. so, when Stephanie asked if i’d participate in her Foodie Fake-Out party, where we all post a recipe that looks/seems like something different than what it really is, i couldn’t wait to join! while I don’t usually do step-by-step photos for recipes, i thought it might be helpful on this one. excuse the iPhone pictures, but that’s all i had on hand for process photos! line the bottom of a springform pan with parchment paper or wax paper – for easy removal of the cake when it’s done. for the green/rind layer: allow the green ice cream/sorbet to soften slightly. take small scoops of the ice cream + arrange in a ring around the outside of the pan. take a spatula + smooth ice cream to form it into a ‘rind,’ about 1″ wide by 2″ tall. if the ice cream gets too melty, pop the pan in the freezer for 10-15 minutes to allow it to firm up, then continue reshaping. when you have your perfect rind, put back in the freezer + allow to harden completely. for the white layer: allow the white ice cream/sorbet to soften slightly. repeat the process that you did with the green layer, except make it thinner, about 1/2″ wide. again, if it gets too melty, pop it in the freezer for a few minutes, then continue shaping it once it’s hardened back up. once it’s to your liking, put in freezer until hardened completely. 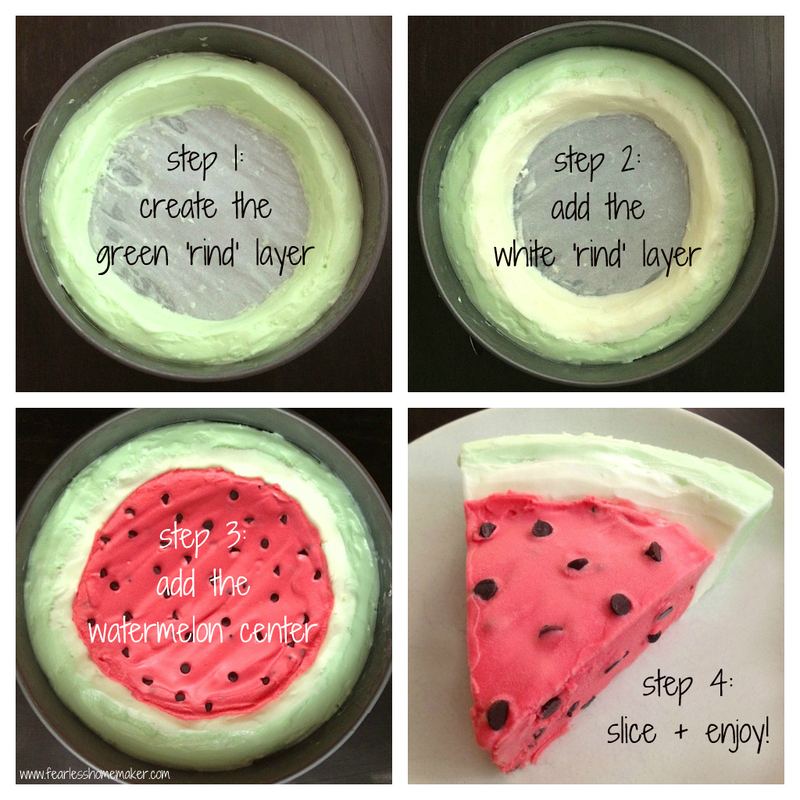 for the pink watermelon middle: allow the pink ice cream/sorbet to soften. transfer it to a medium bowl + mix in the chocolate chips. 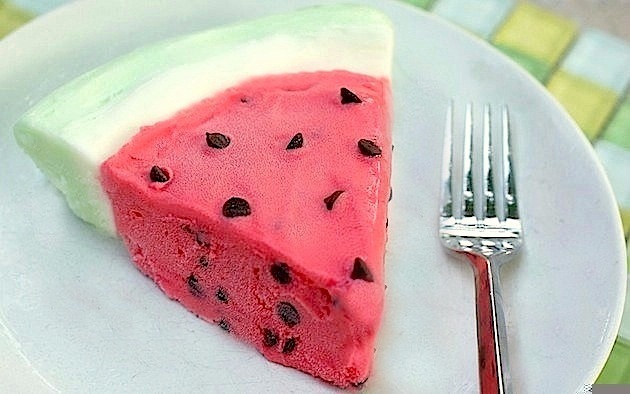 when evenly mixed, spoon the mixture evenly into the middle of the already-prepared “watermelon rind.” top decoratively with the remaining 1 tbsp chocolate chips, + return to the freezer until fully re-frozen. when ready to serve, release the springform pan, cut into watermelon ‘wedges’ + enjoy! check out the rest of the Fabulous Foodie Fake-Out recipes! 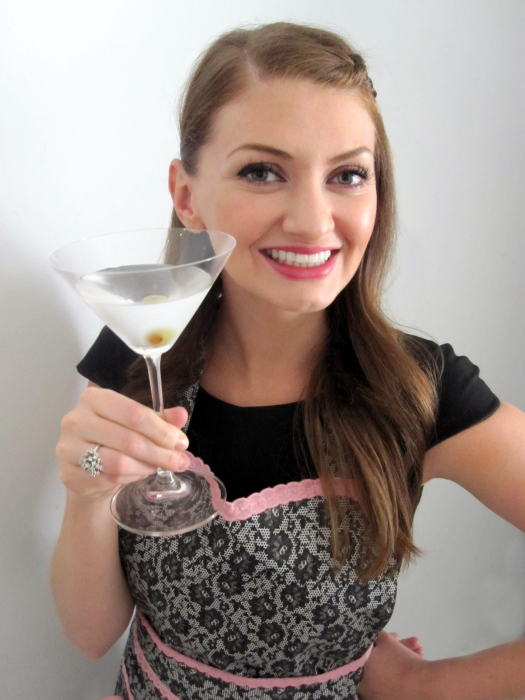 Coming over from foodie fakeout — What a fun idea for a get together! Those hot dog cookies are pretty awesome too! Love the idea!! I featured link to this recipe as Article of The Week, hope you don’t mind. of course I don’t mind – i’m so flattered, thank you! I love seeing how well your “watermelon” turned out. It looks great! I have had a similar recipe for years (I think it came with a measuring bowl or something), but I never tried it. Now I feel a little more inspired to do so. i love this recipie :)))!! This was one of my daughter’s favorites. They wanted it every year for their birthdays. I can’t wait to try this! What size springform pan did you use? Thanks for the recipe. Hi Sandi, I used a 8″ springform pan, and I’d either use that, or a 9″ springform pan – both would work wonderfully. Hope you love this when you try it! layer the white, freeze and then put the pink and chocolate chips….. Yes, Danielle. As stated in the recipe, you’ll let each layer completely re-freeze/harden before moving on to the next step/layer. So do the rind, then freeze. Do the white, then freeze. Do the pink, add the chocolate chips, then freeze. Hope that helps! When I released the springform pan, the ice cream cake easily released from the sides so I cut a slice and pulled it out with a spatula. If it’s seeming stuck, run a knife under hot water to warm up it, and run that along the outside of the cake to help release it first. Hope that helps! I am so happy to hear that, Simona!